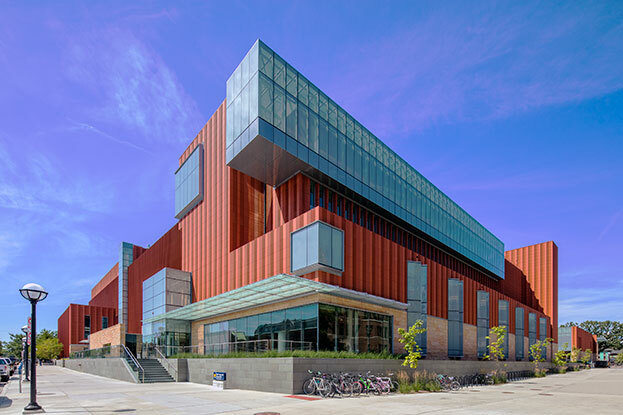 Designed by architects at Kohn Pederson Fox Associates (KPF), the Stephen M. Ross School of Business opened new facilities last year that provide classrooms, study space, offices, and non-academic spaces to serve the student and faculty community. 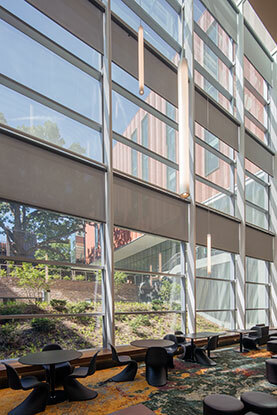 KPF sought to improve the student experience and maximize site usage by constructing a new building, Jeff T. Blau Hall, and renovating the connected Kresge Hall. Completed in 2017, the project received LEED Gold® recognition from the U.S. Green Building Council. 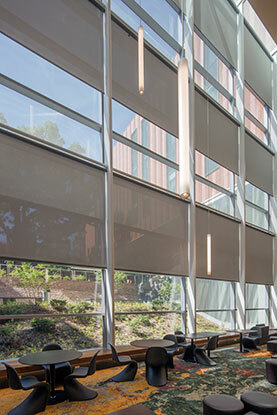 Features such as daylighting systems, low-flow bathroom fixtures, energy-efficient light fixtures and occupant-sensing controls contribute to an estimated 30% energy savings compared to a code compliant building. 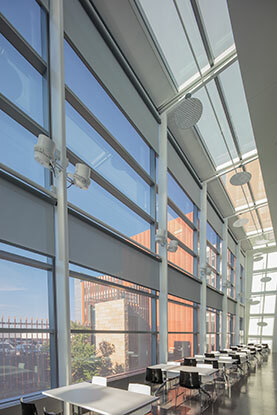 Hunter Douglas Architectural and installers at Creative Windows worked closely with the team at KPF, construction leads at Walbridge Aldinger, and electrical contractors from Conti to balance design intent, daylighting performance, and construction requirements. 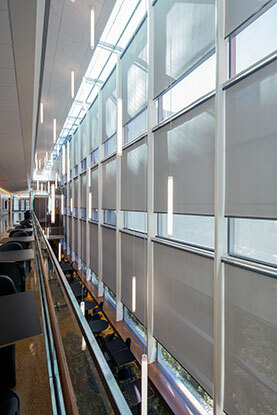 They settled on a system that features several groups of RB 500 automated shades and a bank of TZ100 Zipper Tension System skylight shades. 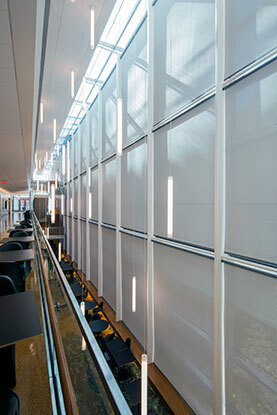 The new Jeff T. Blau Hall atrium, an open space for students to meet and collaborate, consists of three separate levels of 10 RB 500 shades, the highest hanging 50 feet above the main floor. These 30 shades manage solar heat gain and glare from the south-facing windows that overlook the newly renovated courtyard. 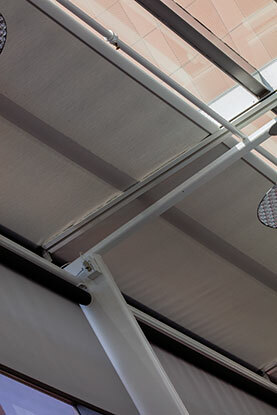 Sunlight can be easily manipulated to keep the area warm in winter with plentiful light and cool in the summer with more regulated daylighting. 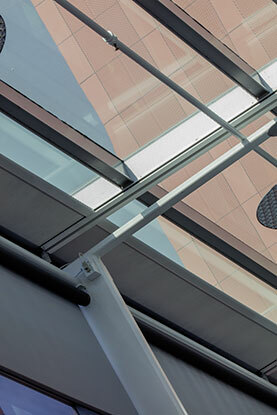 Students and faculty will be able to view devices like laptop screens and phones more easily with less glare as well. 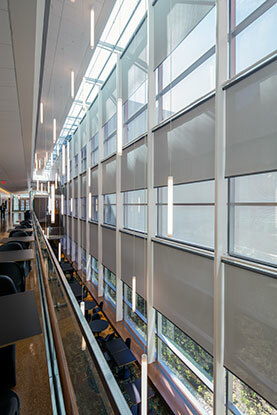 The adjoining Kresge Hall atrium contains 36 more automated shades along the first and second floors, offering views into the courtyard from the West. Both atria are operated by a Somfy Animeo building management system that provides one-touch controls in a central location. 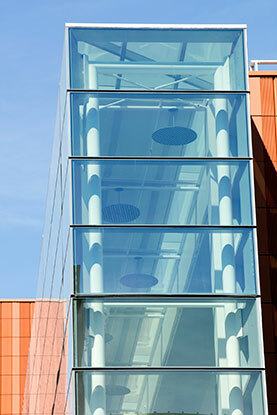 The Kresge atrium also includes 12 custom-framed TZ100 Zipper Tension System skylights mounted at two angles to control natural daylighting from above.